Advanced Resource Managers Limited is a specialist technical recruitment and training consultancy providing IT jobs, engineering jobs and business solutions jobs for contract and permanent staff throughout the UK and Europe. 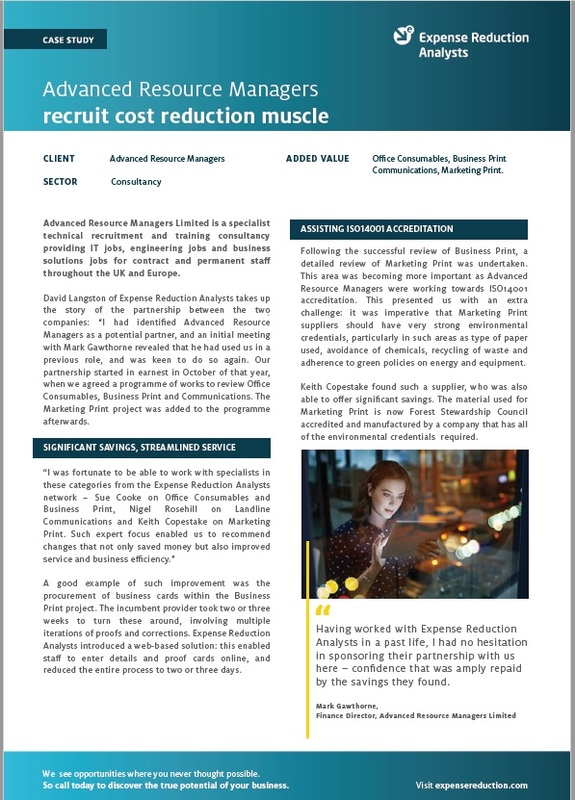 David Langston of Expense Reduction Analysts takes up the story of the partnership between the two companies: “I had identified Advanced Resource Managers as a potential partner, and an initial meeting with Mark Gawthorne revealed that he had used us in a previous role, and was keen to do so again. Our partnership started in earnest in October of that year, when we agreed a programme of works to review Office Consumables, Business Print and Communications. The Marketing Print project was added to the programme afterwards. To find out more about how ERA helped Advanced Resource Managers, including results, savings and more details from the client, download the full case study now.